I have mentioned it many times: personalization is one of the favorite themes of today's customers. A watch brand must now be able to integrate into its collection variable aesthetic elements that adapt to the tastes and demands of these customers. Small brands have understood this for several years: watches are generally available in a wide variety of dial and strap colours. Established brands have had much more difficulty in entering into this process. The personalization? Come on, you're not serious, it's not "luxury"! That was the comment I heard from a representative of a major market player a few years ago. The context has changed a lot and now this parameter is well integrated. We just have to remember that the quick-change strap system was one of the stars of the latest SIHH to understand that the trend is well understood. At Jaeger-Lecoultre, personalization has been an integral part of the manufacturing process for many decades. Because its flagship watch, the Reverso, is perhaps the most suitable for this approach thanks to the possibility of engraving or setting the case back and wearing the watch with this decorated side visible. The history of the manufacture is punctuated by examples of sumptuous creations involving different métiers d'art sublimated by the talents of the craftsmen. 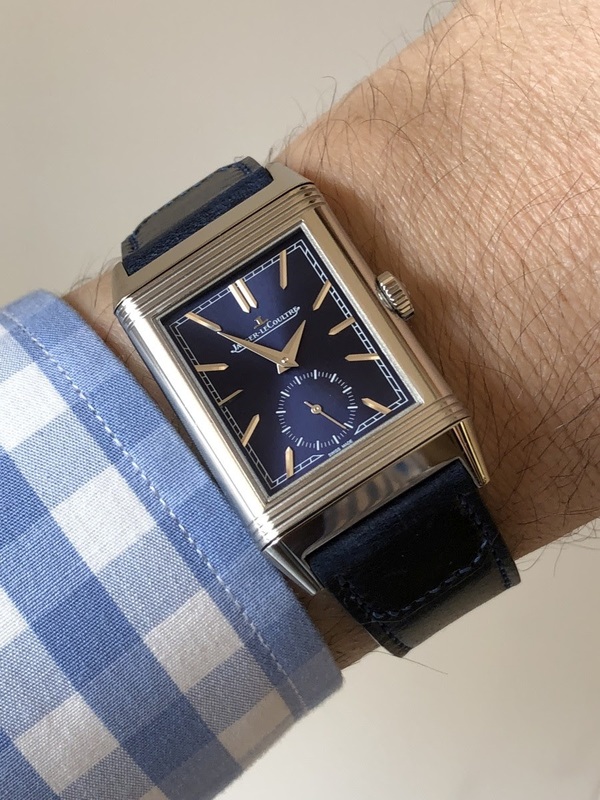 This is a bit of a paradox: at a time when the theme of personalization is at the forefront, I find that Jaeger-Lecoultre is not communicating enough about its ability to respond to this demand, despite the presentation of the Atelier Reverso. There are many reasons for this, but the tendency to release more and more complicated Reverso and whose casebacks are occupied by another complications has certainly contributed to this context. - its size is ideal, not too big, not too small and perfect on my wrist (45.6mm x 27.4mm). - its sunrayed blue dial is superb: it offers sumptuous shades that turn purple, which gives it a touch of originality. I also really like the peripheral railroad scale. - the dauphine hands are charming and go very well with the circular area of the second hand. - it is powered by a handwind movement (I don't like automatic Reverso) and the calibre 822/2, with a frequency of 3hz and a power reserve of 45 hours, is very pleasant to wind. - and finally, the caseback is solid, which gives the opportunity for a beautiful engraving. All I had to do was to find the theme. And the idea came naturally to me. It was the strap that inspired me. The Reverso Tribute Small Seconds is indeed equipped with a strap designed by Casa Fagliano... and this Argentine origin was the spark. 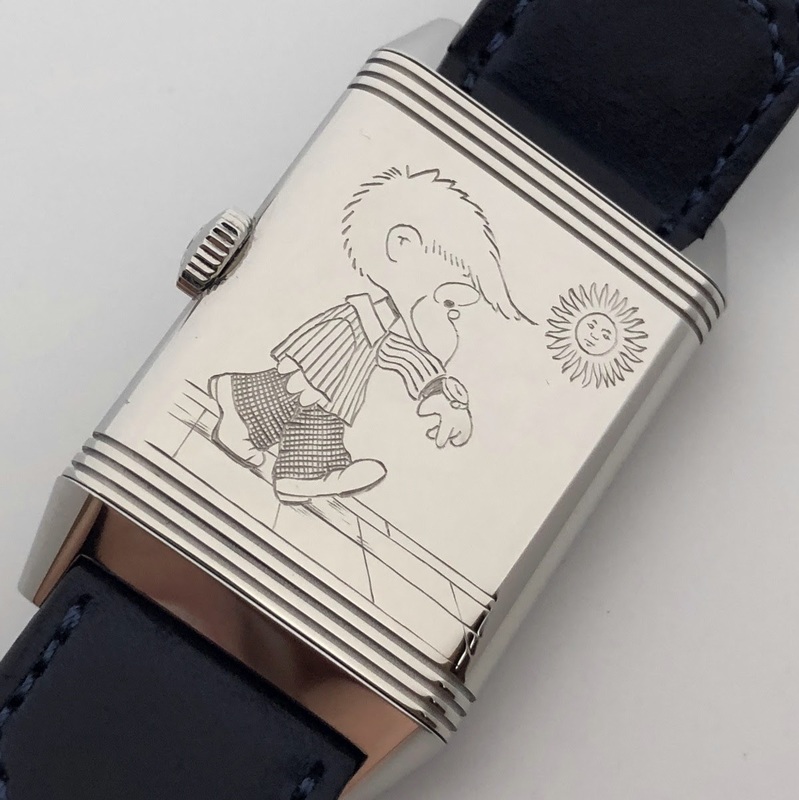 As an absolute fan of the Argentinean comic strip Mafalda, I remembered a scene in where my favorite character, Felipe, wore a watch, obviously mechanical since the story takes place in Buenos Aires in the 1960s. Felipe is proud of his new watch and walks while looking at it and smiling... as every watch lover is able to do. I have a little Felipe in me and we all know it, each passionate person keeps this child's soul. So, by deciding to have this drawing reproduced, I wanted to give a nod to the passion that inhabits us and the magic of mechanical watches that enchant us. To reinforce the Argentine atmosphere, the right side of the dial is decorated with the "Sol de Mayo" of the Argentine flag. Such a project required a talented craftsman and I contacted Christophe Parat, an extremely talented engraver who is used to work on the Reverso cases. So I discussed with Christophe on the project, modifying it to make the character big enough and stand out well. The result exceeded my expectations. Carried out by hand, the engraving is deep, precise (I even see the hands of the watch!) and undoubtedly has more charm than an "industrial" engraving. I can feel the character's movement but also all his emotion when discovering his new watch. In short, it expresses a feeling that I myself felt when I discovered the engraving and wore the watch. My Reverso Tribute Small Seconds is now MY watch, i. e. a piece that integrates the result of a personal approach that can remain hidden and known only to me. Which watch apart from the Reverso can offer such a capability? Very few, actually, and the additional advantage is that the cost of customization can remain very reasonable if the pattern remains simple, such as initials. The pleasure of wearing a personalized watch is truly unique. My deepest thanks to Christophe Parat for having interpreted the project with talent and mastery and to Jaeger-Lecoultre (and in particular its team from the Paris Place Vendôme boutique) for having unveiled a model that gave me such an opportunity. Great watch and love the Personized touch you gave it . It came out looking very cool! Thanks for sharing! 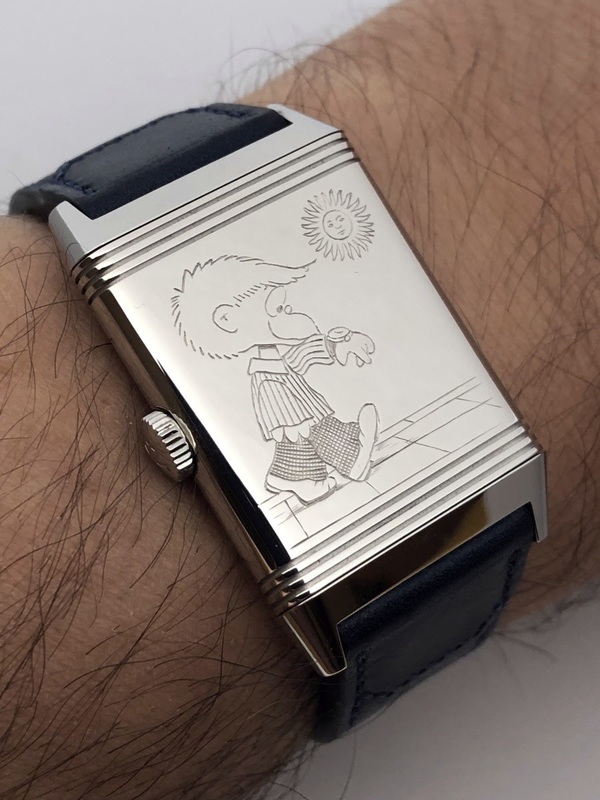 Personality on such a dress watch is beautiful, I originally felt a little nostalgia with the image as I thought of Charlie Brown. Watch looks great and hopefully I can get one done to display. 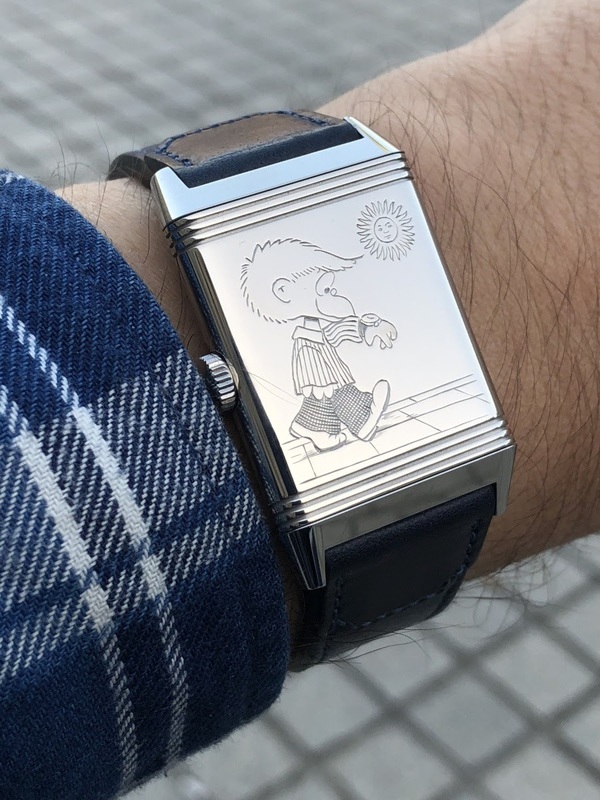 A very nice tribute to the Reverso concept! And what a good idea to have such a personalised item. Best, É. Ps: and the dial is stunning! Such a cool design, love it. well chosen. a happy make my day engraving.